In two vans traveled 14 Americans. Not a nasty, dirty, car seat ridden van full of crying and sing-a-long songs. These were road trip vans and that means college students, good snacks and all the comforts of travel. With the Tasman Sea on their right and the Totara Park on their left, these 14 Americans — all hailing from Southern Utah University — commenced on a grand adventure to explore New Zealand. But it wasn’t for souvenirs or passport stamps, oh no it was for much grander things — they embarked to obtain secular knowledge, the kind that only comes from studying abroad. With the expedition’s focus on cultural art and J.R.R. Tolkien’s “Lord of the Rings” trilogy, the group set out and immersed themselves in the culture of the Long White Cloud and the creation of Middle Earth. Traveling across the world may seem unnecessary to learn about a book found in any library, but Jenifer Drew, an English Education major from Las Vegas, Nev., claimed it more than needed. “I wanted to get something more out of my education. I have learned so much from my professors in the classroom and I was hoping that this experience would bring learning to life in a whole new way. I wanted to really live and experience a new culture and learn about “The Lord of the Rings,” while being in New Zealand,” said Drew. But a country with such rich traditions required Toanui Tawa, SUU lecturer of English, New Zealand native and the group’s guide, to obtain permission from the native Māori tribe for the traveling party to roam the island freely through a tribal ceremony. After taking part in the Māori Powhiri ceremony immediately following their arrival, the wandering T-Birds then commenced touring the island studying its geological beauty via glass bottom boats and viewing sites filmed in the “Lord of the Rings’” movies for the film studies students on the tour. But it wasn’t just film students that learned from Tolkien’s fictional lands, Bishop saw the necessity of the art and English students to learn from the movie sets. “As we were planning this excursion, we wanted all students to learn from the other disciplines; literature and film students could see how cultural art influences films or novels and vice versa,” said Bishop. This chance that a handful of students were able to take part in, both Bishop and Tawa stated is an invaluable opportunity and something that all professors and students should take part in. “A study abroad experience, no matter where you go, is the most valuable experience for any student. To extend your education outside the walls of a classroom has an immeasurable return. No, it’s not cheap, but its well worth your experience and money,” explained Tawa. Bishop mirrored his comments and went on to say that the main learning outcomes wasn’t just learn from Tolkien or about cultural art forms, it was to gain confidence to travel and appreciation for differing cultures. After road tripping through New Zealand, accidentally recreating the Lord of the Rings trail, and developing memories with friends that will never be lost, these 14 Americans traveled home, but New Zealand will forever bind the fellowship. 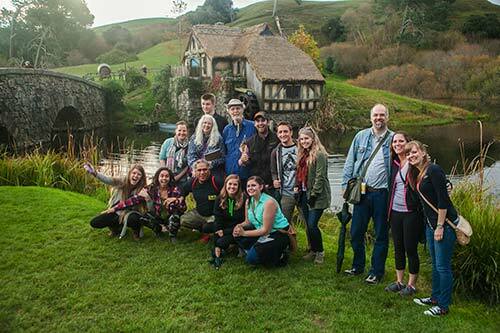 SUU’s Department of English and Department of Art & Design, are both hoping to take part in the coming years in study abroad excursions to London, Switzerland, and maybe New Zealand, though Bishop expressed nothing could top the 2014 New Zealand tour.